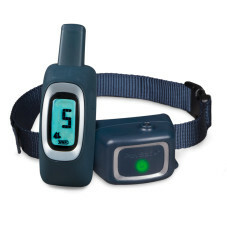 How old does a pet have to be before using the Spray Bark Collar? Your pet should be at least 6 months old before using the Spray Bark Collar. The collar may be too large for dogs under 8 lb. The Spray Bark Collar is safe and effective for most breeds and sizes of dogs, though it may be too large for dogs under 8 lb. to wear comfortably. Can I attach a leash to the Spray Bark Collar? No. This can result in pulling the bark sensor too tightly against your dog’s neck. Attach a leash to a separate, non-metallic collar or a harness, making sure the extra collar does not put pressure on the bark sensor. Can I use the PetSafe Spray Can Refill to refill the cartridge? No. The cans used for the PetSafe GentleSpray, Elite Little Dog Spray Bark, Elite Big Dog Spray Bark, Elite Little Dog Spray Trainer and Elite Big Dog Spray Trainer cannot be used with this collar. The spray cartridge is 100% recyclable. 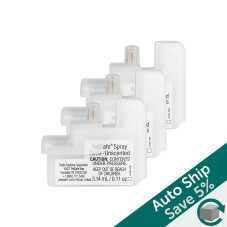 When the spray needs to be replaced, simply remove the cartridge and replace with a new one.